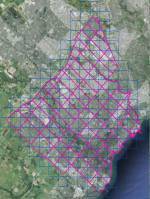 Scalable Vector Graphics interactive online maps of the city of Brampton. Adobe SVG plugin must be installed to use the web page. Also contains air photos from 1994 to the present. This is an online mapping application containing parcels, air photos, recreation information, wards, etc. Legend shows railroads; roads; Royal Canadian Air Force Stations; boundaries; pack trails; canoe routes; cultural detail. \ Shows lakes. "In order to assist the user of the map in connection with the intricate maze of water features, the main drainage courses are shown in a dark blue tint". 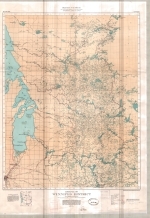 Includes the "Declination of the compass needle January, 1927".